Starbucks employs one-to-one marketing when it comes to promotions via MyStarbucksRewards. I’m sure I’ve mentioned this before but this is an excellent time to mention it again. This means that those who have a registered Starbucks card receive individualized promotions. There is a downside to one-to-one marketing: It’s confusing. At no point can a barista say, “our promo this weekend is a bonus star for each panani sandwich that you buy.” Rather, the best that the barista can say is, “You might be earning bonus stars for bakery goods, if you got that email for bonus stars on bakery items. Or, you might be earning bonus stars for buying sandwiches. It just all depends on which promotion email you received.” Even the amount of bonus stars for each item purchased can vary. Your own promotion might vary a lot from these examples. 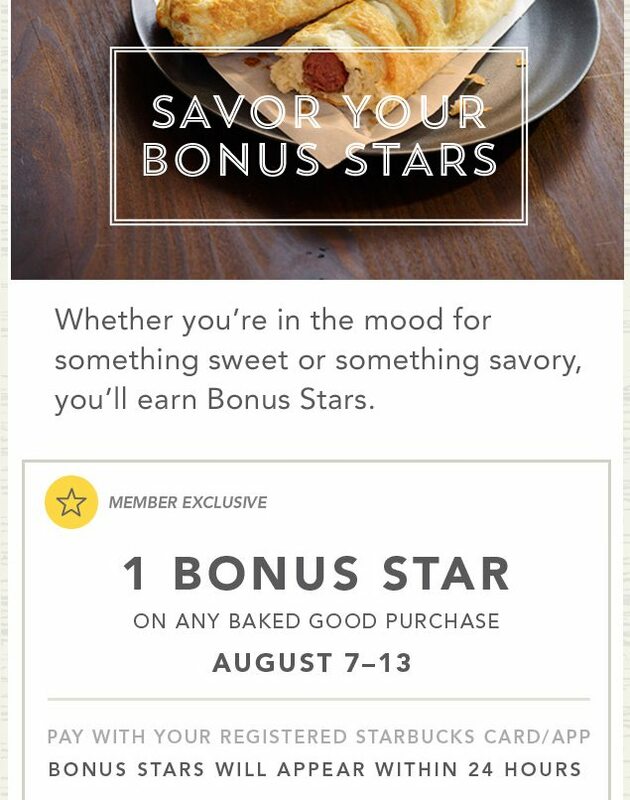 Some people may have received a promotion that involves bonus stars for buying bistro boxes at Starbucks, August 7th – August 13th. There are a lot of bonus stars happening from August 7th – August 13th! And yet another reader of this site emailed me that she received a promotion to earn bonus stars for buying shaken Teavana iced teas at Starbucks. During the month of August, if she buys four shaken teas, she’ll earn three bonus stars. If she buys seven shaken iced teas, she’ll earn ten bonus stars. I find it sort of interesting to see the variety of promotions that people receive. It’s possible that some people didn’t get any at all. 🙁 But now is the time to check and see. If you use an email address for your Starbucks profile that you rarely check, you might want to check now. Also, I’m pretty sure that these promotions show up somehow in the iPhone Starbucks app. Enjoy your August promotions! Which one did you receive? 60th & Columbia Starbucks in Portland: Concept Drive Thru. And Leschi Starbucks Adds Clover - Reserve. I received the same bonus star offer as you; two bonus stars when purchasing any Starbucks panini, salad, or sandwich from August 7, 2014 through August 13, 2014. I’ve not tried the Panini’s so this will make it more worth my while. I would have preferred either of the 2 promotions above. The promo I received was – 2 Bonus Stars on any Bistro Box Purchase. I have no interest in the Bistro Boxes, but it is what it is. I received both the one for lunch items and the one for iced tea. It looks like the one for iced tea involves joining something. Like Chgo., I received the Bistro Box promotion this round. 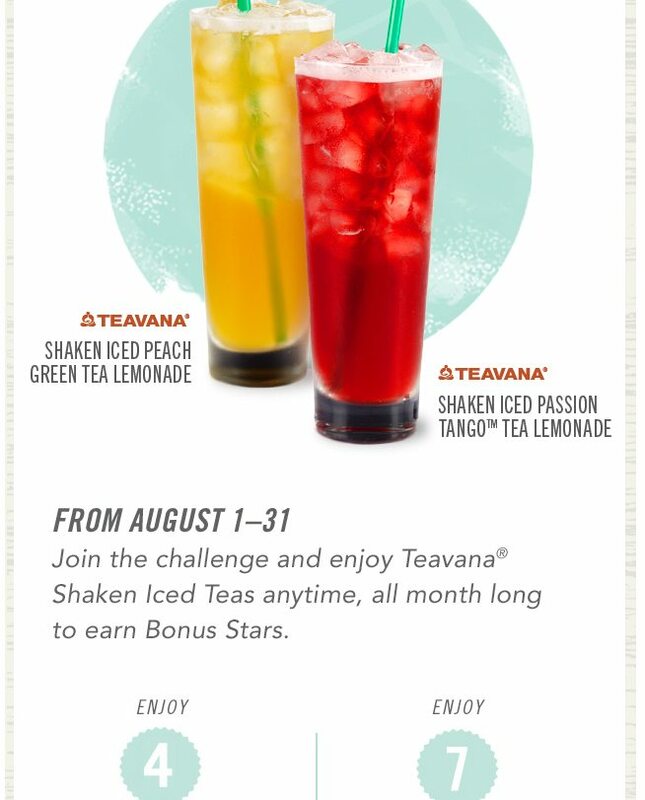 I also received a monthlong promo on Fizzio that required a click to join, like the Teavana promo. My promotion is 3 bonus stars for Teavana shaken teas. @Chicago – I’m with you. I don’t think the bistro box one sounds very exciting at all. Would you forward that to me? Thanks! @Carol – That’s a great bonus star offer! Hope you don’t mind but I think I’ll add that here too. I got the lunch sandwich promo and will use it before it expires. I am just curious- do you think that SB is now switching to tailoring the promotions to individual rewards members rather than having general promotions? @purple1 – They’ve almost fully switched to one-to-one marketing, for about a year now. 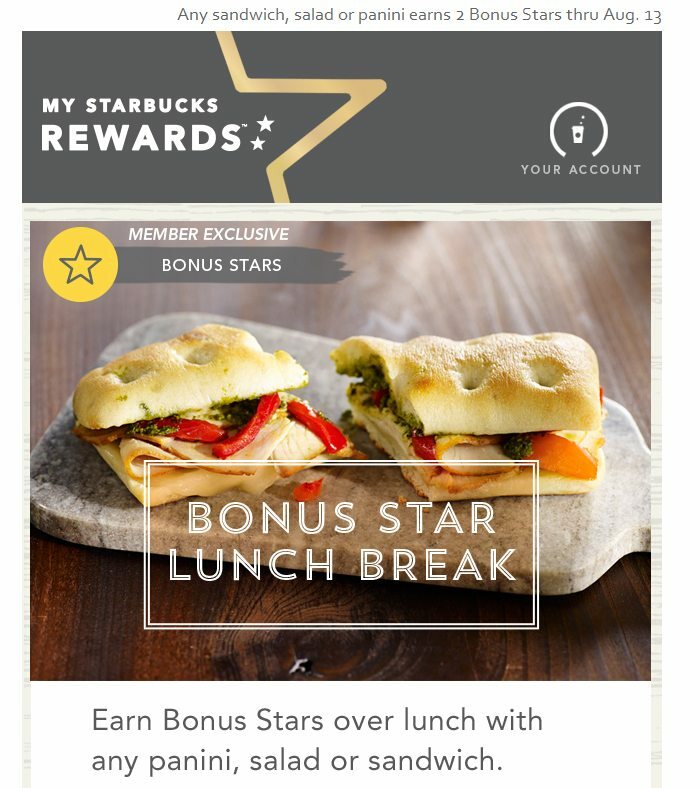 I haven’t seen a generalized MyStarbucksRewards limited time bonus star promotion in over a year. It is ALL one to one marketing. My August promotion is for the Fizzio drinks: buy 3, get 3 bonus stars or buy 5, get 10 bonus stars. Received the Bakery one… nothing like having an excuse to eat something so yummy! The best bonus stars go to the family members who are infrequent Starbuckers. The smaller deals go to the regulars. Well said Dad Cooks! I so remember when the promotions were so much better. The question remains- in my opinion- is it being done this way to get more people in the store, because they had been losing money on promotions, not getting enough money on promotions? I guess no one but those in the marketing dept will know for sure. I too got the bonus stars offer for lunch items for this week. My major offer for August is the Fizzio offer – 5 stars for 5 purchases, 12 stars for 8 purchases. I’m going to disagree with DadCooks about the effectiveness of the individualized offers. Basic marketing strategies work, but they aren’t so basic in this case. By leveraging the information of millions of purchases per week by MSR customers, they can decide just how much of a bonus to offer to reel you in for an additional purchase. The numbers reported by Starbucks each quarter prove that the MSR program is an unqualified success. As for people complaining that they didn’t get a good enough deal, unless they quit Starbucks for good, it’s just noise. As a regular customer, you’re getting everything that MSR promised you – Free items every 12 stars, and personalized offers from time to time. Chris W I surely cannot speak for Dad Cooks but I am not sure he is saying that the MSR program is not working. Maybe his point is that its original intent has wavered? Dad Cooks would you like to elaborate more? I am also a regular customer and make use of the rewards program, but I do see weaknesses in some of their program. In my view, over the years the program has its successes and its failures as Melody as detailed in posts. I certainly would not want to see it go. I got the same 2 bonus stars for any panini, salad or sandwich between Aug 7th-13th. I plan to do this, although 3 bonus stars would be a bit nicer. I find it odd how they tailor offers to different people. That’s got to be a lot of work on their end. And confusing to baristas that want to promote offers. They have to be generic in their promotions. I get these frequently, but it has been my experience that I have to contact customer service every single time to actually claim my bonus stars. I think that their one-to-one marketing is an ambitious enterprise, but I’m not certain that Starbucks is completely there yet. I always seem to get my stars automatically. I’ve never participated in the ones where you have to join a challenge. I have been gold for over a year and have never received a bonus star promo…. or any other for that matter. Just the notifications of early access to the shaken teas. I didn’t get any promo this month 🙁 Maybe I’m “too regular” and Starbucks knows they don’t need to offer me any promotion to get my business! Hello Starbucks marketing department – I would definitely try a lunch item if you offered me bonus stars. @purple1 – You are correct, I am not saying that the Bonus Star Program is not working, but I do say it has strayed from how it was originally implemented. @Chris W. – yes, Starbucks regularly reports that the MSR Program is a success, but I have yet to see any data that shows that any of it is due to the Bonus Star Program. And you are technically correct in that Starbucks is providing what the MSR Program promises. However, a company need to pay attention to the “noise”, realizing that you cannot please everyone. As the leader in Gift Card / Loyalty / Mobile payments, Starbucks is never going to release details of MSR marketing. This is a huge competitive advantage that appears to be something that Starbucks is willing to perhaps even license to other companies in the future. The success of the company is increasingly linked to the future of MSR, which is why they are branching out into pre-orders, and other features. And while companies should and do listen to both formal and informal feedback (i.e. ‘the noise’), data driven programs like this should be driven and improved by the data – which we’re never going to see. They are going to continue to strive to strike the correct balance between satisfying existing frequent customers, while continuing to provide increased (better) incentives to less regular customers so as to have the chance to turn them into frequent customers. I have 4 bonus stars for any food item purchase. It’s such a great deal, I might actually get something the next time I’m at Starbucks even though I never get anything to eat there. Maybe that’s the point? I received another bonus star promotion in my email yesterday. This one is for packaged coffee from grocery stores. From 8/8 to 8/17, for every star code I enter, I’ll get three bonus stars in email later in the month (up to four times, or 12 bonus stars). As usual, am agreeing with DadC…. most of the promos seem aimed at trying to get something I don’t often buy. I suppose that’s the ‘idea’. Yankee Candle has what I guess you’d call promos…. (buy one , get one) BOGOs. That works for me more than these promos that if I’m not already buying the product, I’m unlikely to do so in order to get another *star*. I realize lots of retail places have such deals, just using Yankee Candle as an example. I don’t visit Starbucks nearly as often as I used to years ago when they had the long-running breakfast pairings promotion. After they stopped that, my visits went down dramatically. I didn’t receive a lot of e-mail promotions until the last big update to the rewards program. Now I get a lot, but they ARE for things that I normally buy when I do visit. I got the one for buying coffee in a grocery store. I almost never buy coffee in a grocery so doubt I’ll use it. I like Reserve coffees and only buy whole bean no matter what it is. But the great news is my local Starbucks reopened yesterday as a Clover/Reserve store! It’s only a mile away so that’s better than any of the promos to me. Gee, I’ve received none of these offers, and I used to get them on a regular basis. These offers are immensely frustrating to me as I never receive promotional emails from Starbucks, yet these offers are still being loaded on my card. Most of the time, when the promotion is a coupon, at least I can see that from the Starbucks app, but not when it’s a bonus star offer as I just have to find out for myself. I purchased a panini on the 9th, and not only did I not get the 3 bonus stars my e-mail said I would get, I didn’t get any stars. That hasn’t happened to me before that I know of. New Star Dash promotions showed up in my family’s emails this morning (Thursday, 8/14/2014). There were two different promotions received. Join the Star Dash and start sipping your way toward your Bonus Stars, August 14-27. There is a Join the Dash button that must be clicked. Bonus Star codes and redemption instructions will be emailed by 9/5. Once again, this promotion is giving the less frequent Starbucks customer the better deal. I too received the star dash offer that DadCooks received – I love a challenge… BTW, I earned and successfully earned my bonus stars for the bonus star lunch break! I had to e-mail, but I got my lunch break stars too. They said they recently went through a system update, which is causing problems. Promotions often attract strangers in the door, and lots of businesses these days offer only NEW customers promotions. Of course the challenge then is how to keep the repeat customer happy so they don’t leave or go knocking on another door in search of their own newbie deal. Loyal customers want to feel appreciated, and special. IMHO offering the best loyalty incentives may just be the perfect espresso crema. 1). The probability of selling to an existing customer is 60 – 70%. The probability of selling to a new prospect is 5-20% – Marketing Metrics. 2). Research shows that a 10% increase in customer retention levels result in a 30% increase in the value of the company – Bain & Co.
@Starbuxgal – Those are interesting numbers. It reinforces few different things for me. There’s a critical importance in treating every new and unknown customer to your business as if they were a long-term regular. Don’t let them walk out unhappy! Also though, I’ve frequently heard it said that for every lost loyal customer, it can take acquiring at least 2 or 3 new customers to replace them – there are marketers who pound the fact that brands should treat their fans like their brand ambassadors and reward them. Some companies (Lululemon and Microsoft come to mind) have pretty sophisticated brand ambassador programs. There’s a marketer named Mack Collier who’s written a book “think like a rockstar” who essentially argues that brands cultivate their fans the way that rock stars treat their fans. 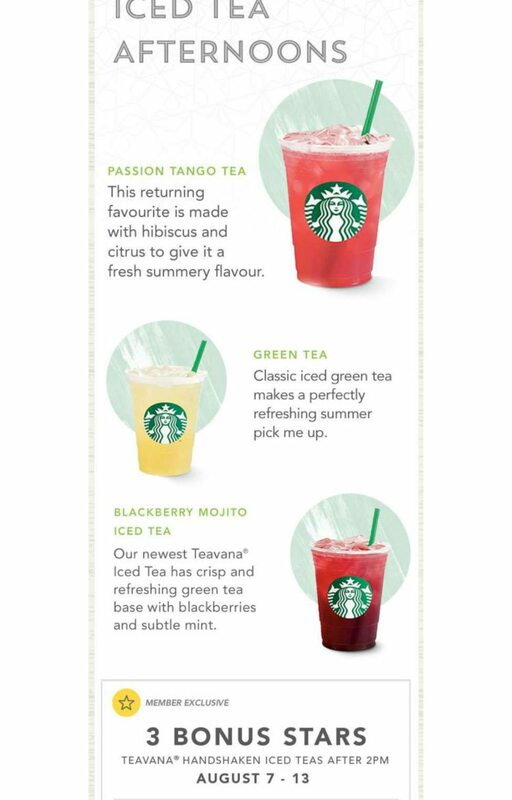 We want to provide you with promotions and offers that are personalized for your Starbucks experience. So the specifics of our offers, promotions and coupons vary by customer. While you may not receive a particular offer or promotion there may be another offer that is personalized for you to take advantage of. If you find that you aren’t receiving promotional email messages and you would like to, go to Starbucks.com/account and log into your account. Select ‘My Profile’ on the right side of the page, then select ‘Contact Info’ on the left side of the page. In the ‘My Contact Preferences’ section, make sure that the box for “Yes, please sign me up for Starbucks email newsletters and promotions” is checked. 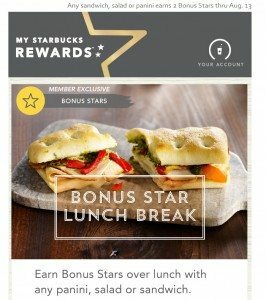 You can see all of your rewards and offers when you sign-in and go to Starbucks.com/account/home or from the Starbucks app go to the ‘My Rewards’ screen and touch the Star count band below the cup. I just got my first e-mail with a coupon code in quite awhile for buy one sandwich or Panini, get one free. Most of them have been: do this, on these days, get this many stars. How does it work if you get two offers? I received: from 8/1-8/31 buy 4 shaken teas get 10 bonus stars or buy 7 shaken teas and get 20 bonus stars. I also received: from 8/14-8/27 collect 5 stars get 10 bonus stars or collect 8 stars and get 20 bonus stars. Do my stars go to both promos or are they treated as separate promos? Does that mean I need to go practically every day to get all of my stars? I look at it this way: I don’t really care how the marketing works and who is getting what promotions dependent on “visit frequency”. I would go for coffee even if there is no promotion. So anything I get on top of my regular coffee runs is gravy! Even if I only get one free drink or a couple bonus stars, it is good. I like the coffee, so I go. Thank should be good. Should’ve complained sooner I guess… rec’d a star promotion yesterday. I get three stars if I visit two different Starbucks by 9/10. SIGN ME UP! I have to visit 5 different SB stores! Interesting how different. If I do, I get 5 stars. I got the same one as Mark. Easy enough to do so signed up.